Well-being cure	From 3 days & 3 nights. Relax through the benefits of Vichy thermal water care treatments. PRICE PER PERSON AVAILABLE FOR 2019. Best price guaranteed: 3 days & 3 nights. From €747 per person. 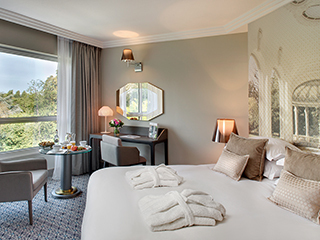 Treatment programme + Deluxe Thermal Spa view room (2 people minimum) including breakfast. Our prices include sales tax and exclude tourist tax (€2.50 per day and per person) and extra treatments and services. Treatment program only, excluding meal and accommodation: €453 per person for 3 days. Please do not hesitate to contact us to book your stay. You need a break in order to rest in a place dedicated to your beauty, well-being, and health? Find an optimum “body relaxation” at VICHY CÉLESTINS SPA HÔTEL. Obtain the mineralizing and soothing benefits of the Vichy spring water, originating from Auvergne’s volcanoes. Massages under Vichy thermal water shower, phyto-mineral mud wraps, hydromassage bath with Vichy thermal water... The Well-being cure is a real art of letting go by Vichy! Our upscale spa is located in a peaceful environment surrounded by parks, water features, walkways, 18 holes golf course, Vichy’s opera, a few steps away from the city center, open all week. The Well-being cure gives you a possibility to conciliate your treatments with the walks at the picturesque parks surrounding the VICHY CÉLESTINS SPA HÔTEL and a discovery of Vichy’s rich architectural heritage. Let our crew be your guide!